'My Little Sunshine' (Marty Schafer & Jan Sacks, R. 2010) Seedling S01-94-11. SIB, 15" (38 cm), Early midseason bloom. 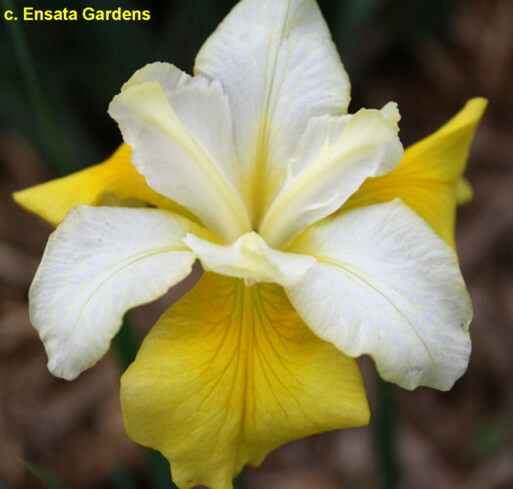 Standards cream to off-white, yellow hafts; style arms cream to off-white; Falls yellow (RHS 12A), signal gold, opens indian yellow (17B), fades to (14A); short, small flowers. S99-22-2: ('Here Be Dragons' x 'Just Cruising') X 'Uncorked'. Joe Pye Weed 2010.
jpg IMG_7316-X2_my_little_sunshine.jpg manage 169 K 20 Feb 2016 - 03:41 BrockHeilman Please contact Brock Heilman for image use.